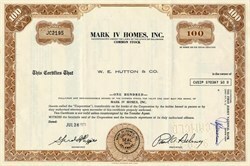 Beautifully engraved certificate from the Mark IV Homes company issued in 1971. This historic document was printed by Corpex-Wolberg and has an ornate border around it with the company's name on top. This item has the signatures of the Company's President and Secretary and is over 35 years old. Mark IV was founded in 1969 as a mobile-home manufacturer. Over the course of the 1970s, it became a maker of automotive and industrial parts. By 1981, Mark IV was out of the mobile-home business entirely and became Mark IV Industries, Inc.. The company is a leading diversified manufacturer of engineered systems and components using advanced radio frequency, information display, diesel and gasoline engine, power transmission, air admission and fuel and fluid handling technologies.